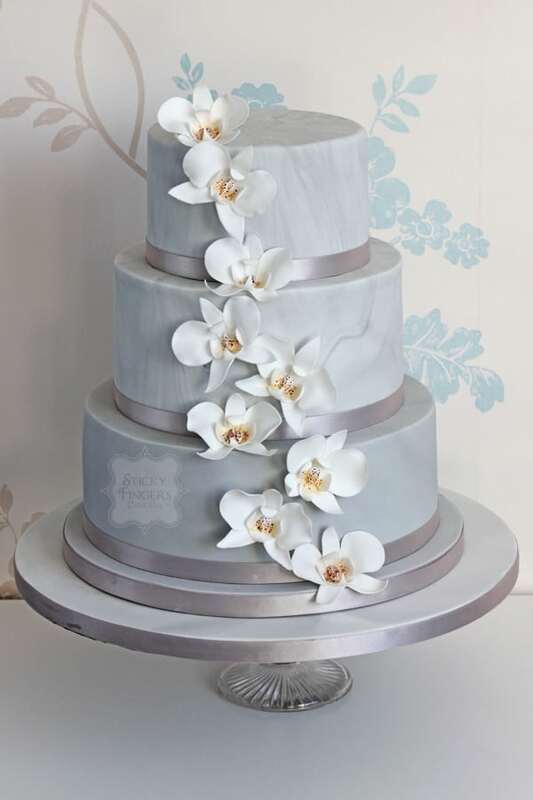 Scrummy, gorgeous and divine are just some of the phrases that have been used to describe our wedding cakes so we’re pretty confident that you’ll love us! 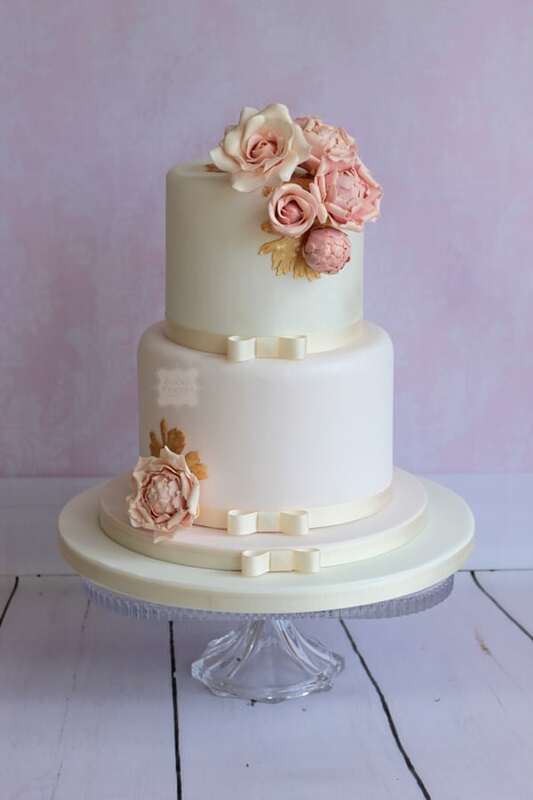 Whether you’re looking for a vintage, contemporary, traditional or unique wedding cake…it will always be delightful! 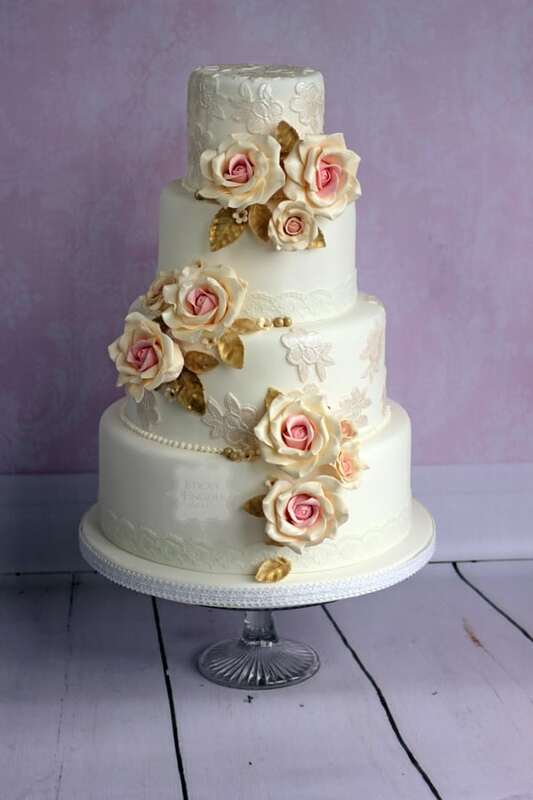 2 tier iced wedding cake with sugar roses & peonies. 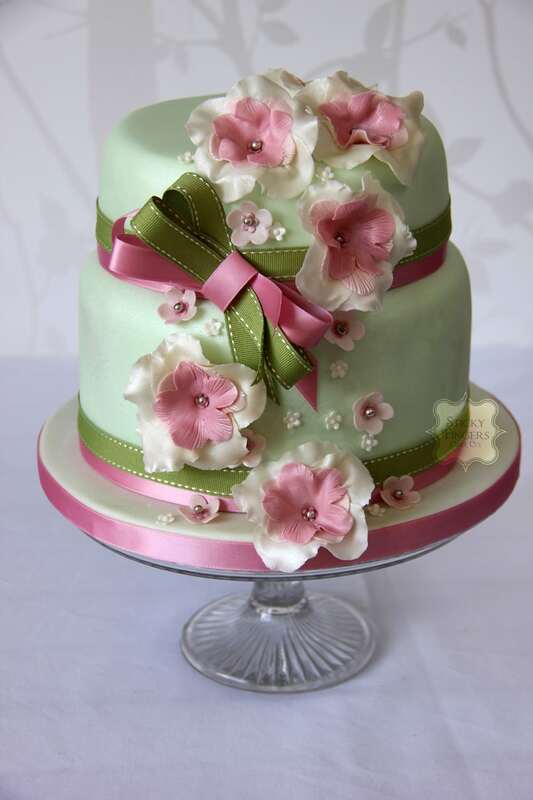 Approximately 60 portions. 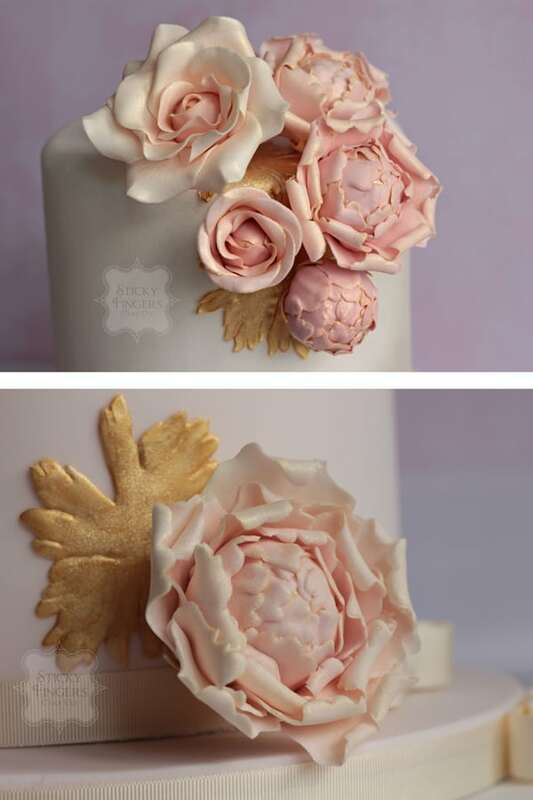 Close up of sugar roses & peonies. 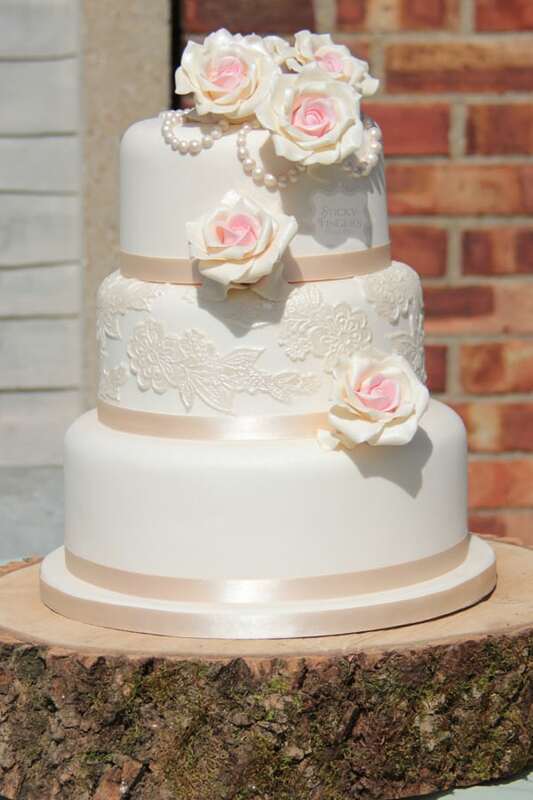 4 tier iced wedding cake with sugar lace & sugar roses. Approximately 120 portions. 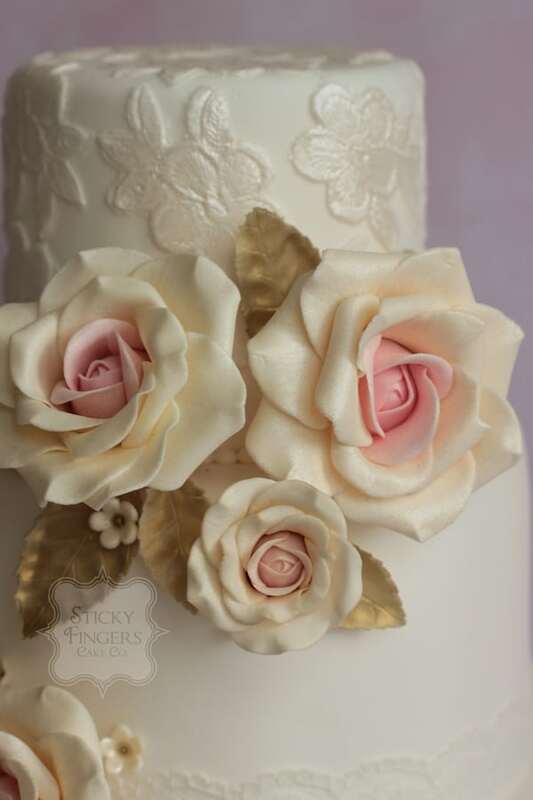 Close up of sugar roses and antique gold sugar leaves. 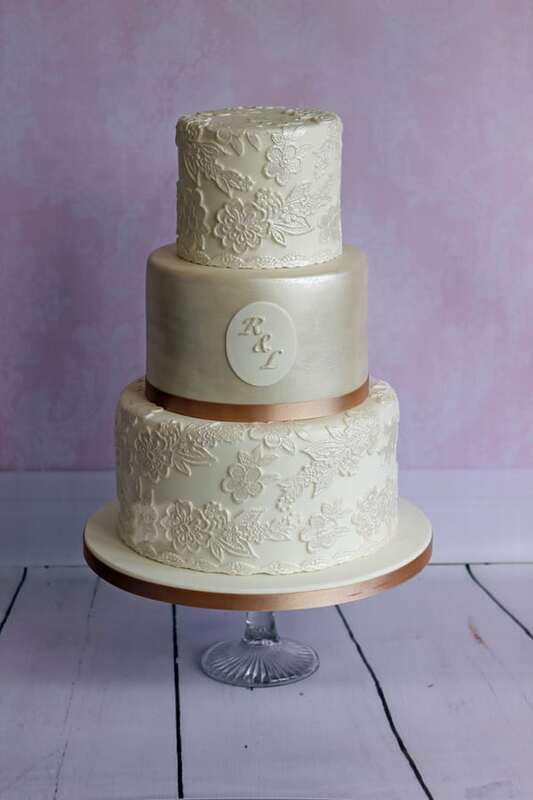 3 tier iced wedding cake with sugar lace and personalised initial plaque. Approximately 100 portions. 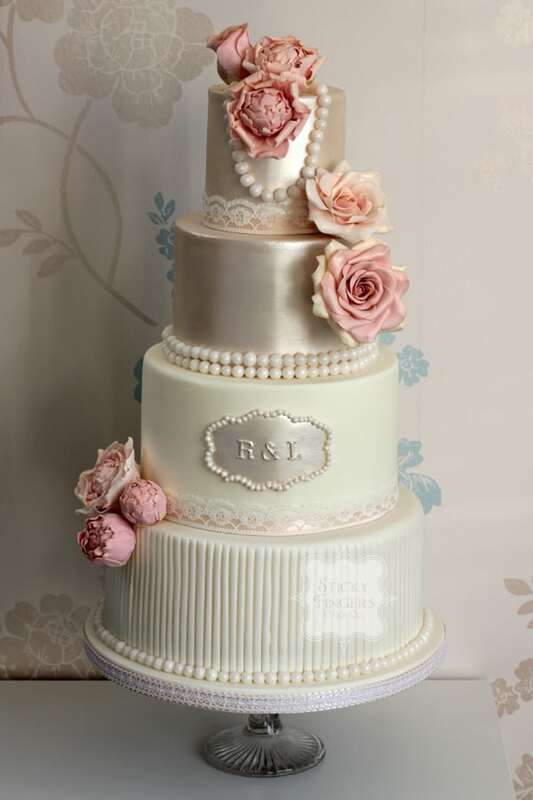 3 tier vintage style iced wedding cake with sugar roses, sugar beads and lace. Approximately 100 portions. 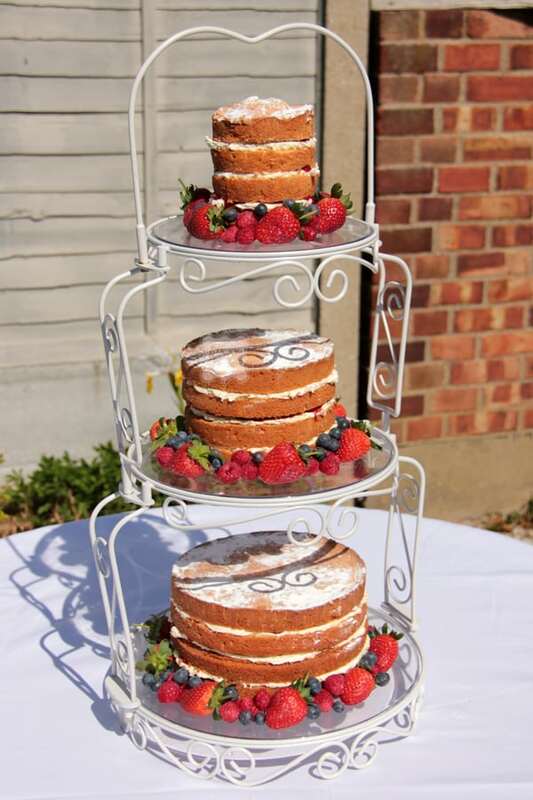 3 tier Naked wedding cake displayed on a Shabby Chic cake stand with fresh berry decoration. Approximately 50 portions. 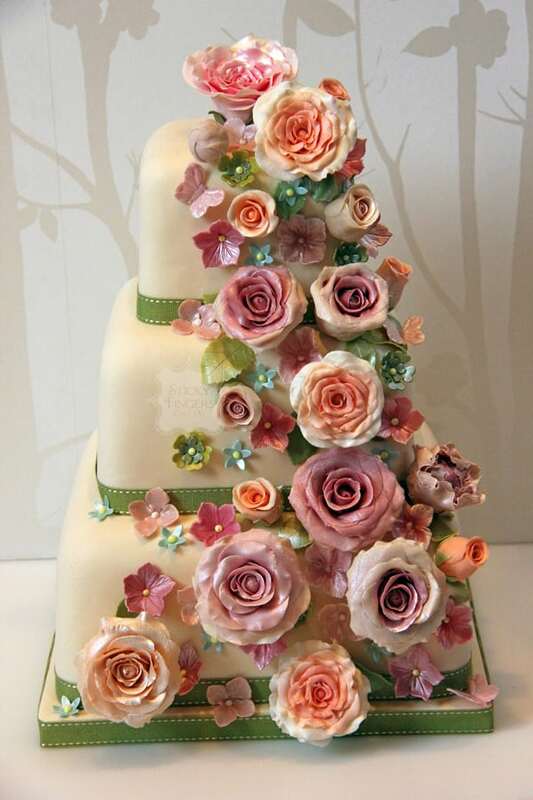 3 tier square wedding cake decorated with a cascade of vintage coloured sugar flowers. Approximately 150 portions. 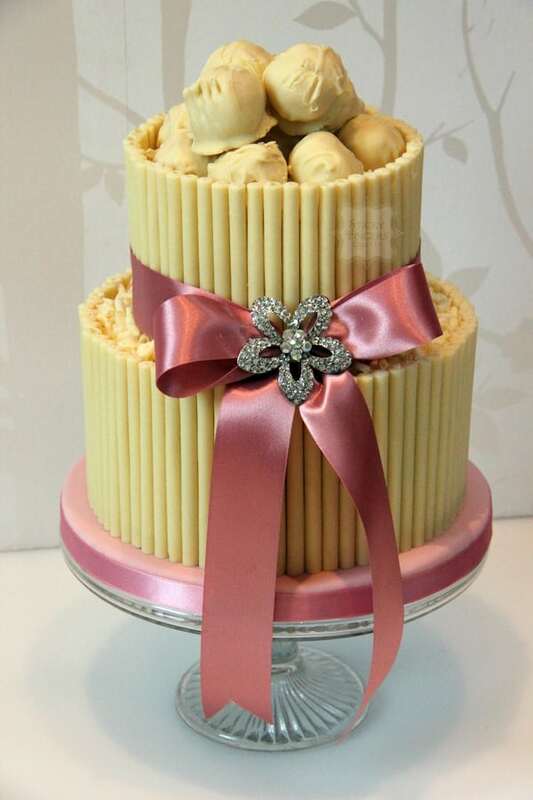 2 tier white chocolate cigarillo wedding cake, decorated with large satin bow, diamante brooch and homemade limoncello truffles. Approximately 40 portions. 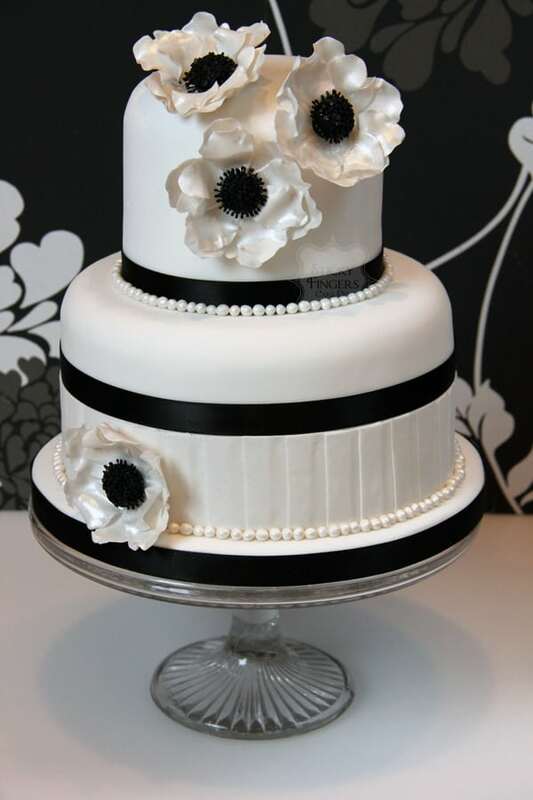 2 tier iced wedding cake decorated with sugar anemones and pleats. Approximately 50 portions. 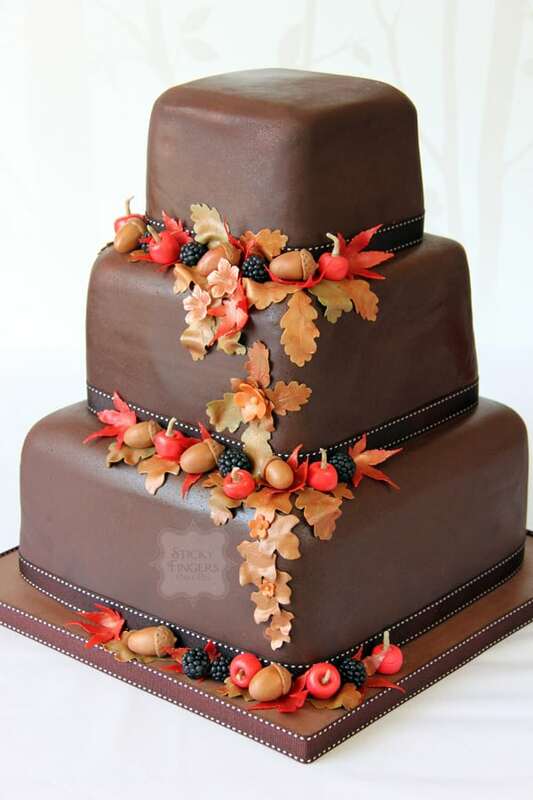 3 tier chocolate covered square wedding cake decorated with sugar autumn fruits and leaves. Approximately 150 portions. 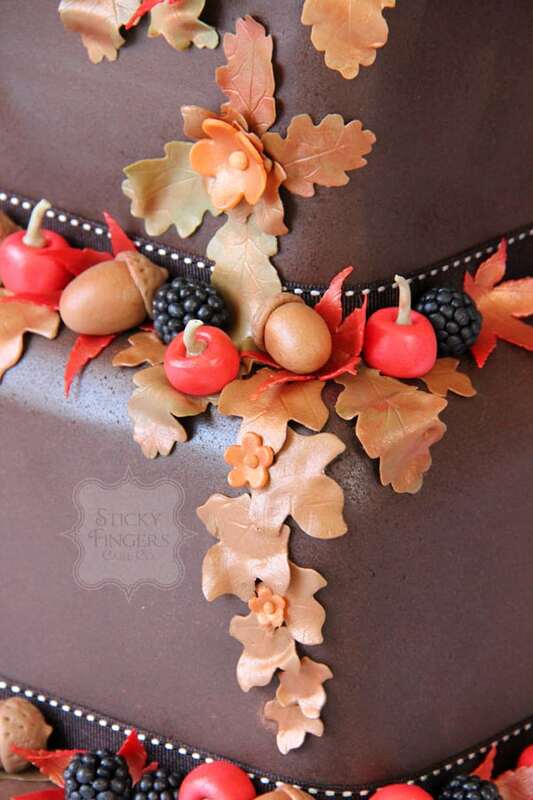 Close up of the sugar autumn fruits and leaves. 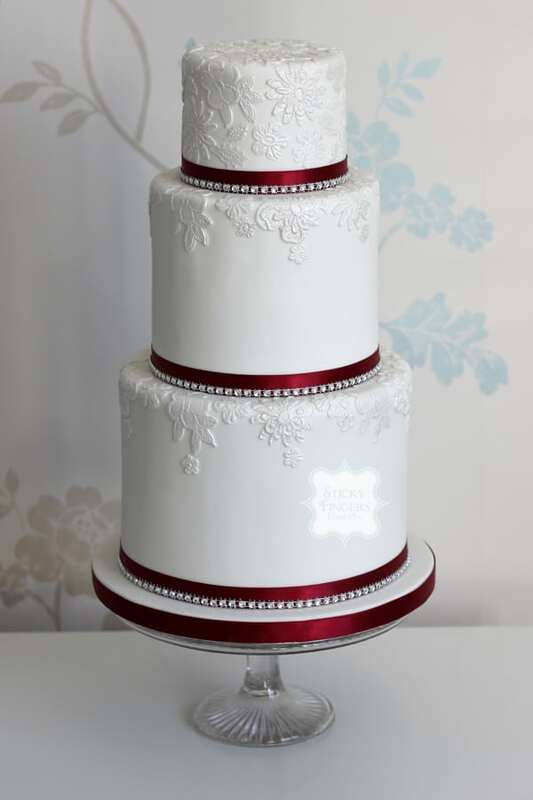 2 tier iced wedding cake, inspired by Cath Kidston. 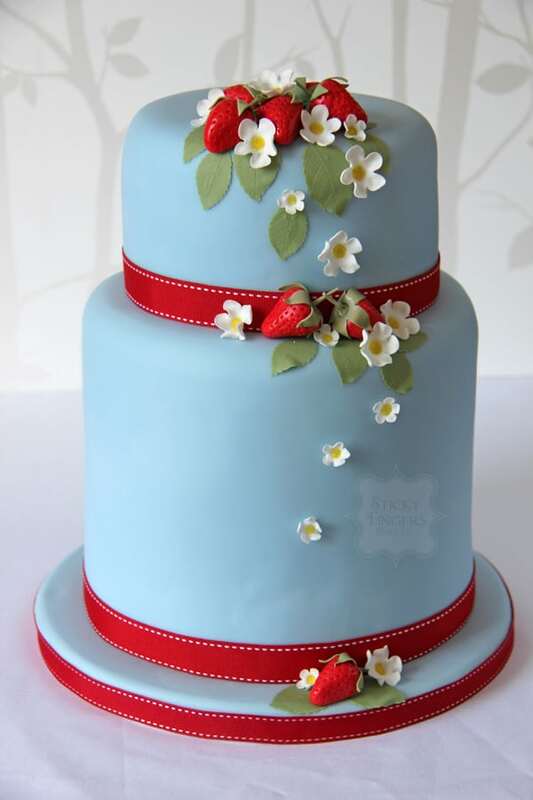 Decorated with sugar strawberries and strawberry flowers. Approximately 100 portions. 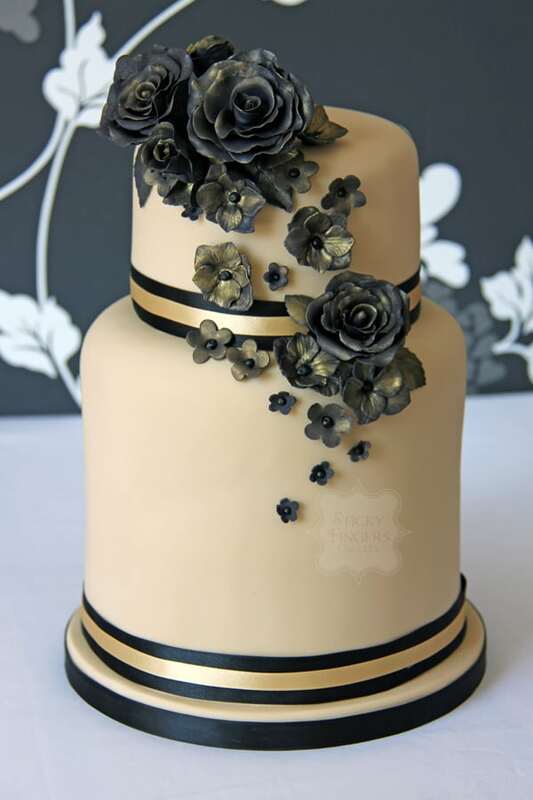 2 tier iced wedding cake decorated with black antique looking sugar flowers. Approximately 100 portions. 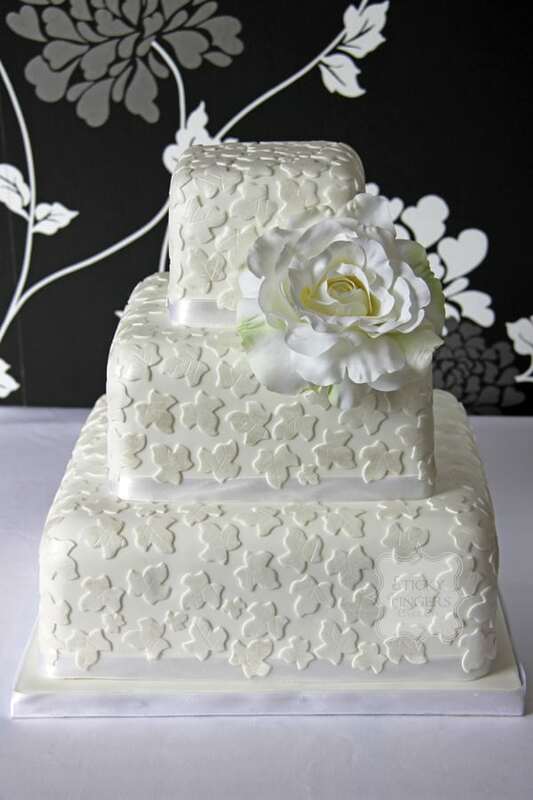 3 tier square iced wedding cake, simply decorated with royal iced dots. Approximately 150 portions. 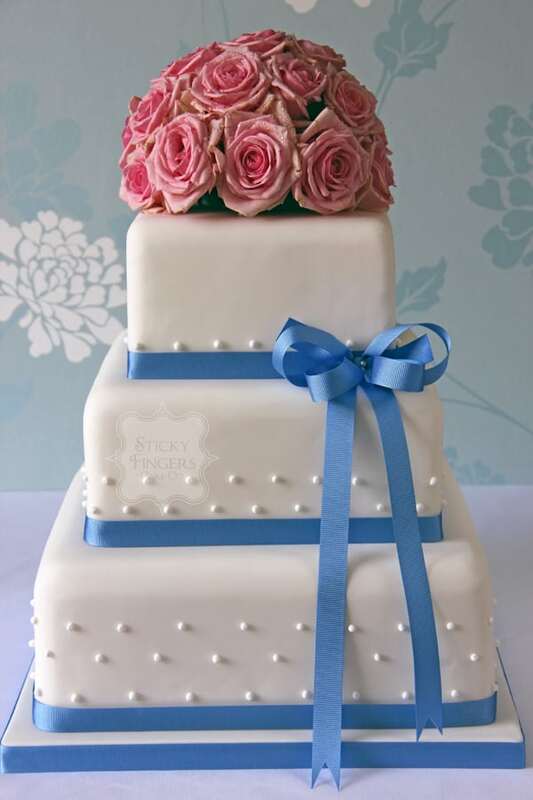 3 tier iced wedding cake simply decorated with large polka dots. Approximately 100 portions. 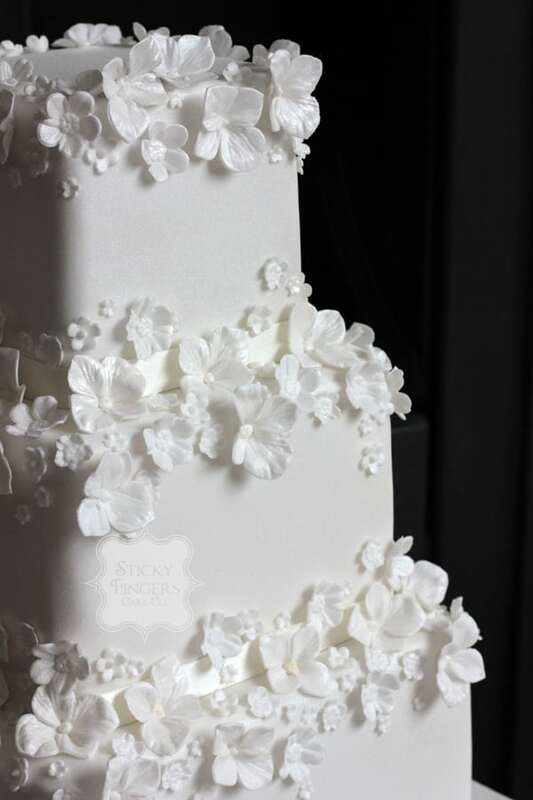 2 tier iced wedding cake decorated with tumbling sugar flowers. Approximately 40 portions. 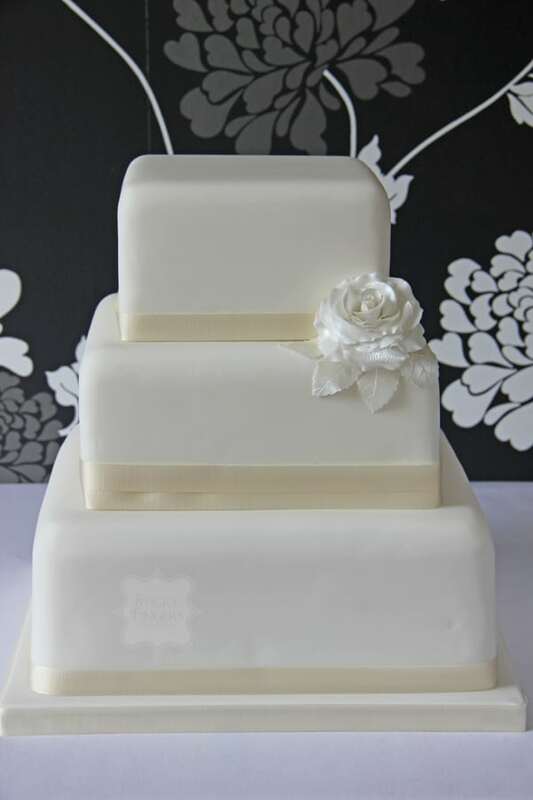 3 tier square iced wedding cake simply decorated with a single sugar rose. Approximately 150 portions. 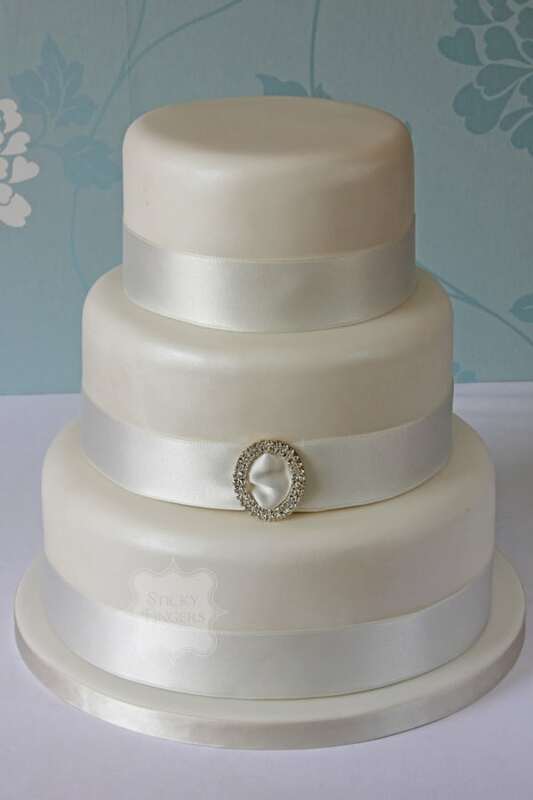 3 tier iced wedding cake simply decorated with a diamante buckle. Approximately 100 portions. 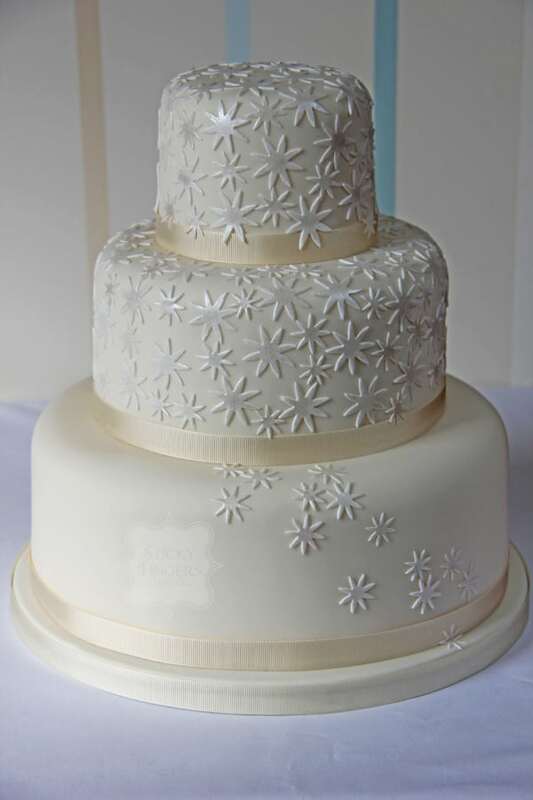 3 tier iced wedding cake decorated with tumbling sugar stars. 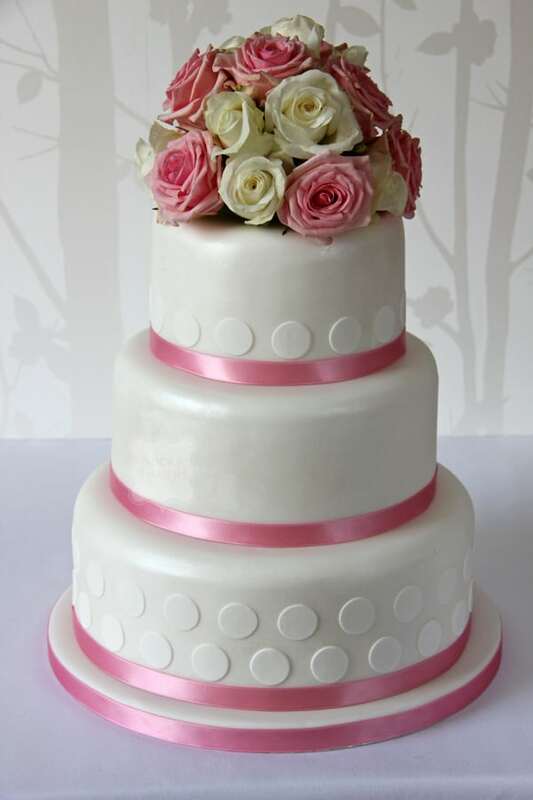 Approximately 90 portions. 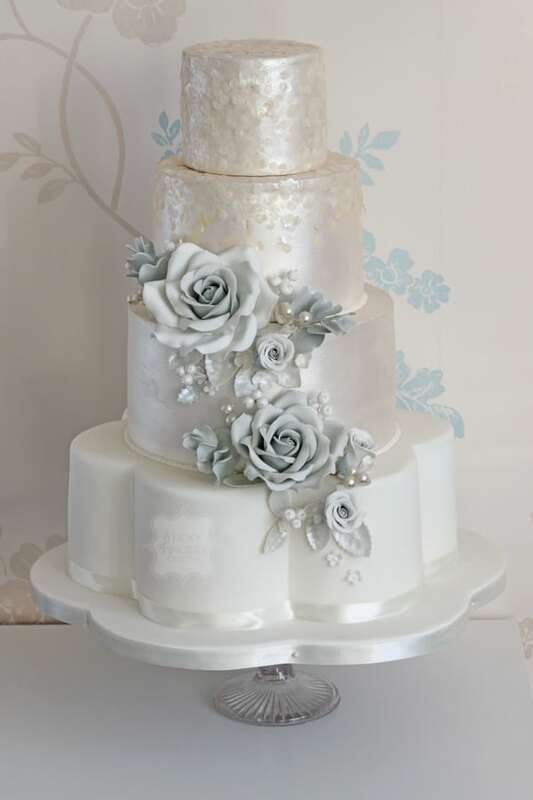 3 tier square iced wedding cake decorated with ivy leaves and large fully blown sugar rose. Approximately 130 portions. 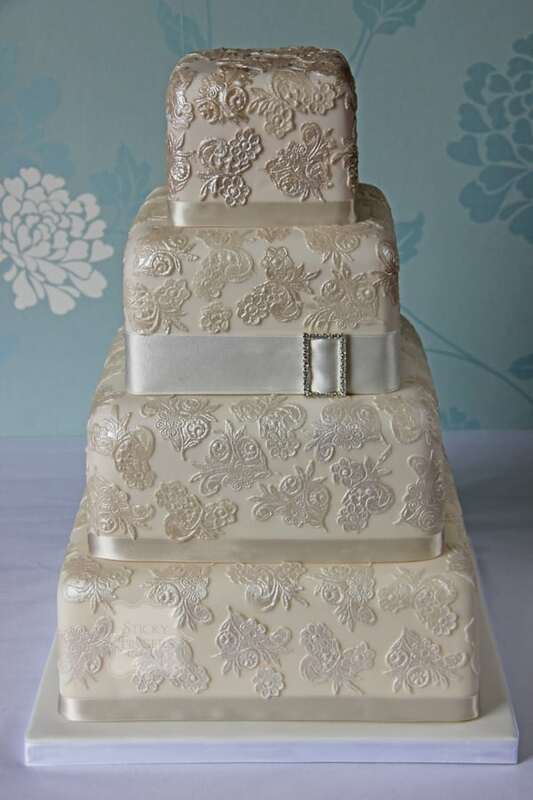 4 tier square iced wedding cake with an all-over lace design and diamante buckle. Approximately 170 portions. 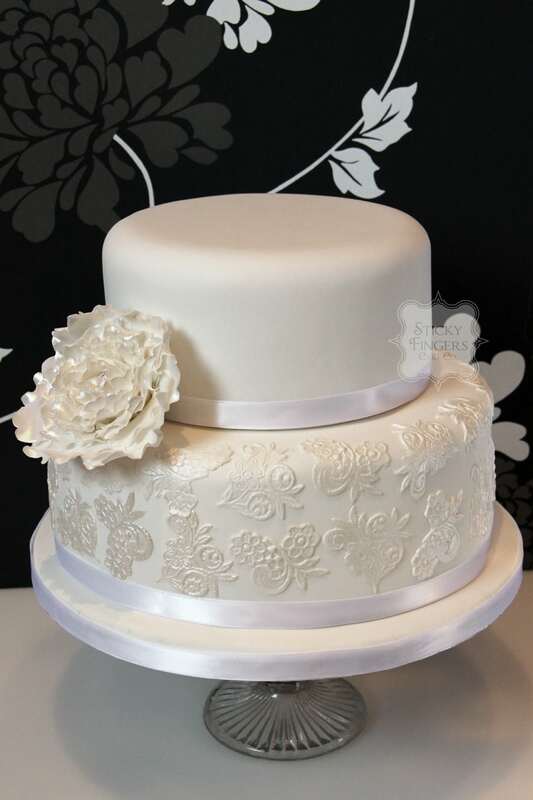 2 tier iced wedding cake with lace design and large sugar peony flower. 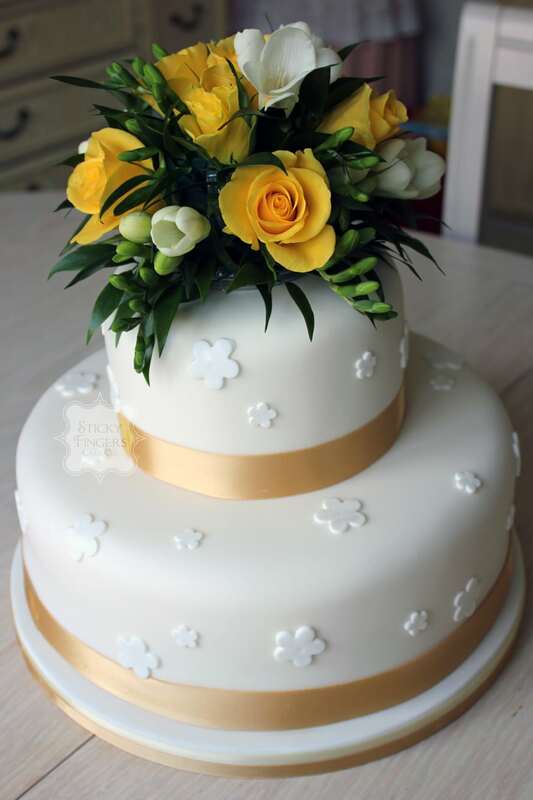 Approximately 90 portions. 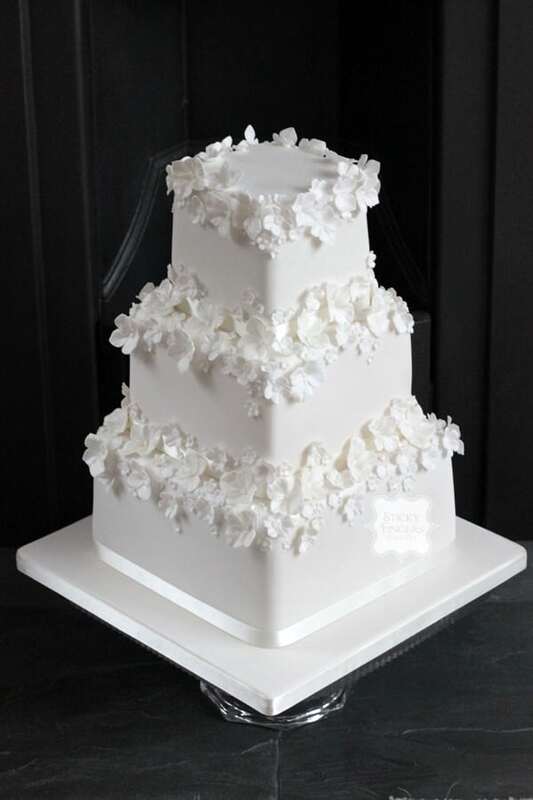 2 tier iced wedding cake simply decorated with sugar blossoms. Approximately 70 portions.